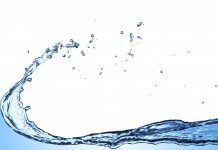 It’s common knowledge that people must drink plenty of water to avoid becoming dehydrated. 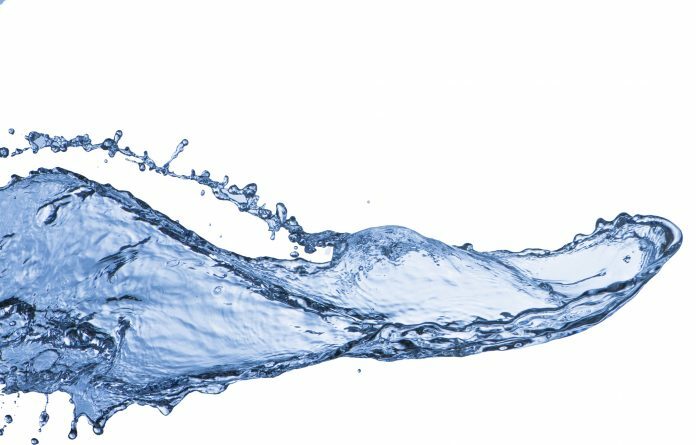 When you get dehydrated, it can cause many problems, such as headaches, dry skin and joint pain. It can even worsen mental issues like anxiety and depression. But sometimes it can be difficult to get the right amount of water. The bkr water bottle was made to encourage people to drink more water by giving them something they want to use over and over. Why Purchase a Glass Water Bottle? You probably know that there are several great reasons to give up your bottled water habit. Buying bottled water can get expensive, especially if you buy higher-end brands. And if you only buy bottled water, those plastic bottles will start piling up pretty quickly, which can negatively affect the environment. It’s also possible that the plastic bottles you’re drinking from are leaching chemicals into your water. For all of these reasons, investing in a reusable bottle is a good idea. But why glass? There are several types of water bottles to choose from, so why this one? Plastic and stainless-steel water bottles are popular choices, but plastic can leach chemicals into your water (even if it’s BPA free) and stainless steel can sometimes leave your water with a metallic taste. Glass water bottles won’t add any harmful chemicals or unpleasant tastes to your water, and although it might not sound like a great idea to carry a glass bottle around in your bag, glass water bottles are generally made from sturdy glass that is unlikely to break during normal use. Perhaps the most interesting thing about bkr is the way that it markets itself. Instead of focusing on the drinkware aspect of the company, bkr promotes itself as a beauty brand, making the bkr water bottle a beauty tool. While this might sound like a strange gimmick, when you consider all of the benefits that proper hydration has on your skin, bkr might just be onto something. Bkr, pronounced “beaker,” was founded in 2011 by Kate Cutler and Tal Winter. These two friends created bkr because there was nothing on the market that was quite what they wanted. They wanted to create a water bottle that was beautiful and that people would be excited about using, and they’ve certainly done that. Bkr is now a very popular brand and, due to the pair’s smart marketing, can even be found in popular cosmetics stores. The bkr water bottle is made of durable soda-lime glass, and each bottle comes with a silicone sleeve that is designed to be fashionable and to add a bit of extra protection to your bottle. Because the bkr water bottle is made with glass, it won’t add any extra flavor to your water and will keep it tasting fresh. The silicone sleeves come in a variety of styles, colors, and designs that are inspired by runway trends. These sleeves are a big part of what makes the bkr bottle stand out. The idea behind bkr’s bottle design is that having something beautiful to drink out of will make people want to drink more water. Judging by the huge response that these bottles have gotten, it must be true. The water bottles come in three sizes: big (1 liter), small (500 milliliters), and teeny (250 milliliters). Although there is not a large number of sizes to choose from, these sizes should be fine for most purposes. One thing that makes the bkr water bottle unique and serves to cement its place in the beauty industry is the new lip balm cap option. Bkr has spent the past several years perfecting its Paris Water Balm, a rose-scented lip balm that fits right in the top of their specially made bottle caps. This makes it easy to hydrate both your body and your lips when you’re on the go with your bkr water bottle. When it’s time to clean your bottle, the lip balm is easy to remove. 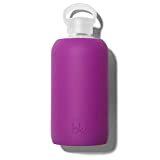 Along with the bottle and caps, bkr offers a few accessories, such as ice cube trays and cleaning brushes, to help you enjoy and take care of your bkr water bottle. Bkr knows that even shatter-resistant glass is fragile, so if your bkr breaks within the first 90 days, you may be eligible for a replacement, depending on how it was broken. You can take advantage of this guarantee only once, and only if the bottle wasn’t broken due to misuse. You can also return or exchange an unused bottle within 30 days of purchase if you are not happy with it. While you can expect glass water bottles to cost more than plastic bottles, even among glass bottles, the bkr is on the pricy side. This is most likely due to the bottle’s status as a fashion and beauty product. What you are paying the most for when you buy a bkr water bottle is the style. The complete bkr bottle, with the silicone sleeve and cap, ranges in price from $ to $, while replacement glass bottles cost only $ to $. This means that, technically, you could get a bkr bottle for a much smaller sum, but if you want the signature bkr style, you’ll have to shell out a bit more cash. Unfortunately, bkr does not sell its silicone sleeves separately, so if you want a different design, you’ll need to buy a whole new bottle. The Soma glass water bottle has a simple and sleek design. Most of the bottle is covered in a silicone sleeve for easy gripping. It comes in several colors, including white, eggplant, mint, blush, sapphire, emerald, grey and olive. The bottle is made from a sturdy, shatter-resistant glass, which might be some comfort if you’re prone to dropping things. For those concerned about plastic, this bottle is a good choice. While many glass bottles still use a plastic lid, the Soma bottle uses bamboo. The bamboo lid is leak-proof, so you can toss it into your purse or backpack without worrying about spills. You can wash the Soma bottle by hand or on the top rack of the dishwasher, but be sure to leave the silicone sleeve on as it isn’t meant to be removed. The cap should only be washed by hand. Perhaps one of the best things about Soma is that it likes to give back. 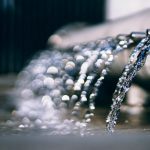 It understands that water is a human necessity, so every time someone purchases a bottle from Soma, it donates a portion of the profit to Charity: Water, an organization that helps provide clean drinking water to people around the world. 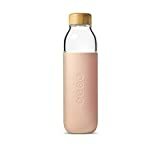 One downside to the Soma glass water bottle is that it only comes in one size: 17 ounces. 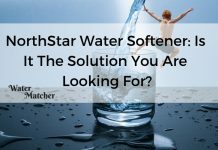 This is about the same size as a standard bottled water, so if you are planning to use your bottle for long trips where you are unable to refill, this might not be the best choice for you. If your bottle has a defect, you can have it replaced or refunded during the first year after purchase. However, the warranty does not apply to breaking or cracking from accidents or misuse, so if it breaks when you drop it or hit it against something, you’ll have to replace it yourself. Lifefactory was founded in 2007 by an integrative designer and a pediatric feeding specialist with the goal of making healthy, well-designed baby bottles. Since then, the brand has expanded to include a wide variety of products, including a glass water bottle for adults. The company uses high quality materials and modern designs to create products for everyday use. 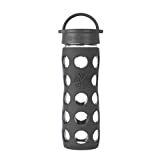 Lifefactory glass water bottles have a large variety of options, so you can easily find the bottle that suits your needs. They range in size from 9 ounces to 22 ounces and come with a silicone sleeve to make the bottle easier to grip and harder to break. The silicone sleeves come in a wide variety of colors including desert rose, teal lake, plum and sea green, among many others. Lifefactory also offers five different cap types to accommodate your drinking style. There are classic, flip, active flip, press 'n' go and straw caps, which you can order as part of your bottle or separately if you would like to have more than one option on a daily basis. These bottles, and the caps, can be washed by hand or in the dishwasher. The silicone sleeve can be removed for washing, but it is not necessary. 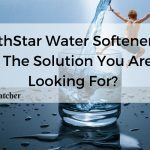 If you are unsatisfied with your Lifefactory bottle, you can return it for 30 days after purchase, but they do not offer any express warranties for future problems. However, if your bottle does break, they offer the option to purchase a replacement glass bottle without the silicone sleeve and cap. This option is not available on the website and can be obtained by contacting customer service. There are many values that Ello wants to express with its products. It wants its products to serve as an expression of your individuality while also providing great quality. Ello glass water bottles come in several styles. The Pure and Syndicate bottles have a simple, straight body style, while the Pure comes with a classic twist-off lid and the Syndicate comes with a flip-style lid. The Elsie bottle is inspired by the classic milk jar shape and has a wide mouth which makes it easy to add ice to your drinks. If you prefer to use a straw, the Wren style bottle has a lid made just for that. 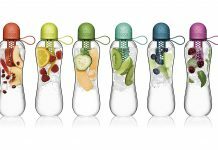 The Zest bottle has a removable base that you can fill with fruit to infuse your water with flavor and nutrients. The Gemma bottle has a silicone straw attached to the lid for easy drinking. Most of the Ello glass bottles have a silicone sleeve for extra protection, with the Elsie and Zest bottles being the exceptions. All of the bottles have leak-proof lids to help prevent spills, and all of the plastic elements of the Ello bottles are BPA-free. Ello glass water bottles and their parts can all be washed in the dishwasher, with the exception of the Zest lid that has wooden elements. If your Ello bottle has any defects, Ello will replace or repair it during the first six months after purchase. However, like the Soma bottle, this does not apply to bottles broken accidentally as the result of dropping or bumping your bottle. The bkr is great for when you want your bottle to act as an accessory as well as drinkware. You can find a good quality glass bottle for quite a bit less money, but if having something pretty to drink out of helps you stay hydrated, then there’s no shame in splurging a little. It will cost a lot less than all of the bottled water you no longer need to buy anyway.